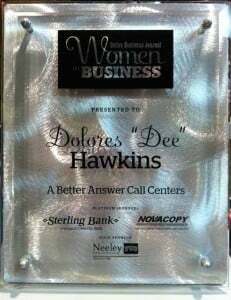 Dee Hawkins, the founder, President and CEO of A Better Answer, has been an honoree in Dallas Business Journal’s “Women in Business” awards. The Dallas Business Journal staff narrows down a list of more than 150 people each year and names just 25 honorees. 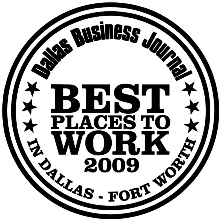 In addition to the “Women in Business” award, the Dallas Business Journal honored ABA at the 8th annual “Best Places to Work” awards in 2009. The publication presents the award to the top 100 small businesses in Dallas and Fort Worth. The employees of A Better Answer Call Centers completed online surveys from the Dallas Business Journal, awarding ABA a ranking of 5.54 out of a maximum of 6.0.